Edward started his return to England from Edinburgh soon after 26th August. On the way, parts of his army, still foraging for food, became detached from the main force and sacked the monasteries of Holyrood and Melrose. It was at Melrose that the Scots, under the command of the very experienced and capable Black Douglas, ambushed and attacked the English. It was a skirmish rather than a battle, but English losses were heavy and the incident curtailed any more foraging away from the main army. 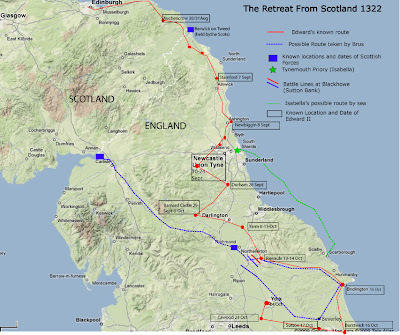 Edward’s route of retreat was down the east coast, via Auchencrow, Stamford and Newbiggin (see map). He later gave his reason for this route as that he would be able to cause more damage to the enemy. Precisely what enemy was around and how he had damaged them though is not recorded. The journey was undertaken quickly but there was certainly no hint of panic, despite the incident at Melrose. In any case, there were no further attacks on the main force of Edward’s army as he went south and he crossed over into England once more and tried to make out that the whole expedition had, actually been a success! How Edward thought he could raise another army, equip and feed it before the winter, heaven only knows. He had already used the best fighting men in the last effort and there was no guarantee that exactly the same thing wouldn’t have happened again. But the king was obviously now desperate for a victory and seemed determined to throw away rationality and practicality. He should have at least re-grouped in York and taken the Queen further south where she would have been safety; instead his actions seem to show a completely misplaced confidence in his ability to conduct a second campaign on the back of a first, disastrous one. It was probably in order to raise this new army that he first went to Durham and then onto Barnard Castle, reaching it on 29th September. Meanwhile, Bruce must have been aware of the chaos in the England ranks. Edward was away from the safety of York and only had the smallest of forces to defend himself and was therefore a tempting target to the Scottish leader. Bruce decided to press home his advantage and crossed the English border on around the 30th September. He didn’t immediately head south though, surprisingly, but waited for a week around Carlisle. Maybe he was waiting for commanders such as the Black Douglas who had, themselves, been busy – not just around Melrose but possibly in harrying and besieging the border castles as well (such as Norham and Bamburgh). However, once Bruce got on the road, he moved with speed, heading for the area where his spies told him Edward was. By now, the English king had moved on to Yarm, still trying to find men who were able (willing didn’t come into it) to fight for him. A clash was now inevitable. * More on the Tynemouth episode in the last post in this series. Tagged Battle of Byland, Black Douglas, Edward II, Robert Bruce, Scottish Campaign 1322, York. Bookmark the permalink. Your map is completely fantastic, and makes the whole thing so much clearer. Thank you for posting it (and spending so much time making it)!! Lol yes, Alianore, it does. Alianore- thanks. I quite enjoyed the map making and it also makes things clearer for me than just reading dates and places. Gabriele – I know what you mean. I need a 48 hour day (with 3 hours sleep) and an 8 day week! "tried to make out that the whole expedition had, actually been a success!" Shoot first, whatever you hit, call that the target. By the way, how did you make the map? I agree with all the comments above, it's terrific.